National Coordinator for Health IT Farzad Mostishari, MD, ScM, appointed David Muntz, MBA, to the new position of Principal Deputy National Coordinator in the Office of the National Coordinator for Health IT in January 2012, while Judy Murphy, RN, FACMI, FHIMSS, FAAN, was appointed Deputy National Coordinator for Programs and Policy in late 2011. Both the positions and appointees have been posted recently on the ONC’s Web site. According to a press release issued in conjunction with 2010 National Health IT Week, “David Muntz, a 37-year veteran of Medical Information Systems, is Senior Vice President and Chief Information Officer for the Baylor Health Care System in Dallas. As CIO, Mr. Muntz is responsible for more than 650 employees who care for a delivery system with more than 140 points of entry. Mr. Muntz works closely with hospitals, leadership, boards, physicians, nurses and clinicians system-wide toward improving information technology at Baylor. Since he joined Baylor in 2006, the hospital has received notoriety in healthcare IT, most notably as the #1 innovator in the healthcare sector on the 2007 Information Week 500 list. “Mr. Muntz is a Fellow of the College of Healthcare Information Management Executives (CHIME) and currently serves on the CHIME Board of Trustees, Advocacy Leadership Team, and Policy Steering Committee. 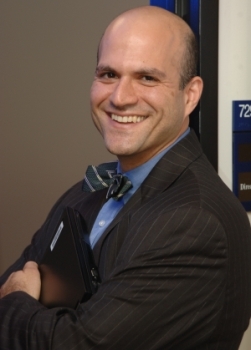 Also an active member of the Health Information and Management Systems Society (HIMSS), he has been a speaker for numerous local, state, and national organizations. He was recognized as CIO Innovator of the Year by CHIME in 2005 and was listed as one of the “Top 5 CIOs” in the June 1999 issue of Health Management. and physician practices, shared a computer based patient record created by Mr. Muntz and his staff. 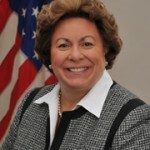 According to the ONC Web site, “Judy Murphy is Deputy National Coordinator for Programs & Policy at the Office of the National Coordinator for Health IT, Department of Health and Human Services in Washington D.C. She is a nurse, who came to the ONC in December of 2011 with more than 25 years of health informatics experience at Aurora Health Care in Wisconsin, an integrated delivery network with 15 hospitals, 120 ambulatory centers, home health agencies and over 30,000 employees. She led the EHR program since 1995, when Aurora was one of the early adopters of health IT. Most recently she was Vice President-EHR Applications, and managed the organization’s successful achievement of Stage 1 EHR Meaningful, with incentive payments beginning in September 2011. “Her informatics interests lie in system implementation methodologies, health IT project management, automated clinical documentation, and the use of technology to support evidence-based practice; she has published and lectured nationally and internationally on these topics. She has a long-standing reputation of patient advocacy and maintaining a “patient-centric” point of view, and approaches her work with unyielding energy as well as dedication, passion, and commitment to the healthcare transformation enabled by technology. 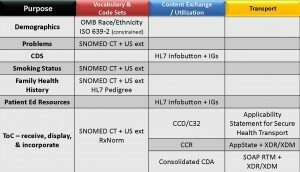 ONC Posts New Organizational Chart Dated Nov 16, 2011. 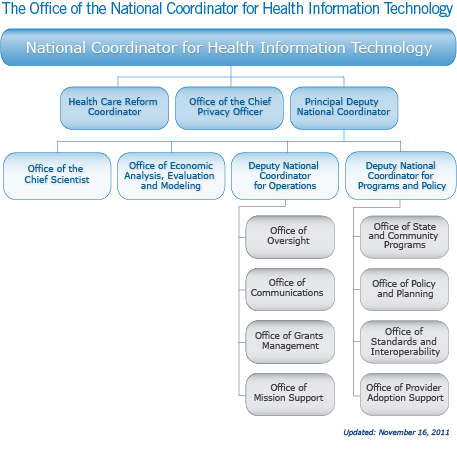 The Office of the National Coordinator for Health Information Technology (ONC) is directed by the National Coordinator and is assisted by the Chief Privacy Officer, Health Care Reform Coordinator, and Principal Deputy National Coordinator as well as the Deputy National Coordinator for Operations, Deputy National Coordinator for Programs & Policy, Chief Scientist, and the Office of Economic Analysis, Evaluation and Modeling. The Office of the Chief Privacy Officer, a position mandated by the Recovery Act, advises on privacy, security, and data stewardship of electronic health information and coordinate ONC’s privacy and related efforts with similar privacy officers in other Federal agencies, State and regional agencies, and foreign countries. 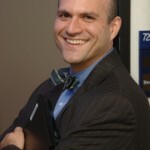 Health Care Reform Coordinator is the principal advisor to the National Coordinator for all Health Reform issues. The coordinator ensures the programs to accelerate adoption of interoperable health IT lay the necessary foundation for health care reform including new payment policy that achieves better care, better health, and lower costs. Principal Deputy National Coordinator works with and reports directly to the National Coordinator and is responsible for day-to-day operations, decision making, and staff management of ONC. 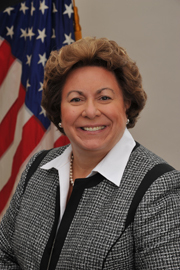 The Principal Deputy will oversee the activities of four offices within ONC: Office of the Deputy National Coordinator for Programs and Policy; Office of the Deputy National Coordinator for Operations; Office of Economic Analysis, Evaluation and Modeling; and, Office of the Chief Scientist. One of the current ONC offices, the Office of the Chief Privacy Officer, is a position mandated by the American Recovery and Reinvestment Act of 2009, and will continue to report to the National Coordinator. 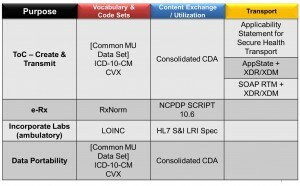 The Office of Economic Analysis and Modeling provides analyses to the National Coordinator, including advanced modeling of the U.S. health care system for simulating the micro- and macroeconomic effects of investing in health IT. The Office of the Chief Scientist is responsible for research and for identifying innovations in information technology that can be applied in health care settings, and which will be the ONC interface for international activities. The Office of Policy and Planning, which is realigned to include all policy development, including privacy and security policy, and is liaison with legal affairs and legislative affairs, regulations development and externally focused strategic planning. The Office of Grants Management, which is responsible for carrying out full lifecycle grants management functions and providing procedural and technical business support to ONC grant award recipients and program managers. The office is charged with awarding and managing ONC’s portfolio of grant programs. Through the execution of the grants lifecycle, the office ensures that federal grant funds are properly awarded and are managed effectively to ensure good stewardship of taxpayer dollars. 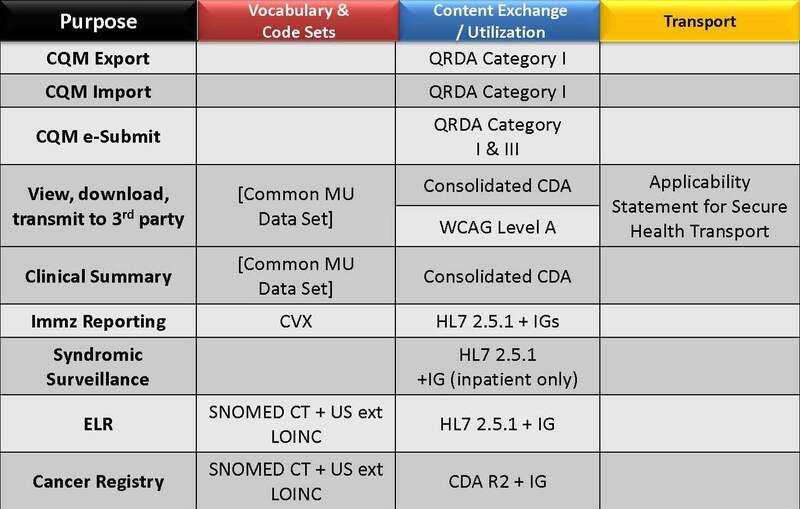 Office of Standards and Interoperability: Doug Fridsma, M.D., Ph.D. 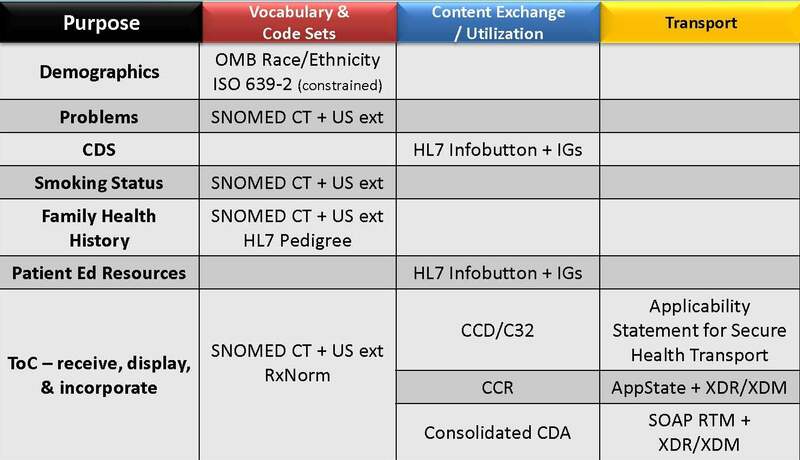 Meaningful Use: Joshua Seidman, Ph.D. Written by Wil Yu, Special Assistant Innovations ONC Office of the Chief Scientist, and republished by e-Healthcare Marketing. Quick Note: This is one of many blog posts that I will be writing in September that highlights how innovation leadership within the health IT and health care communities is changing the health IT landscape. I’ll cover efforts being championed within the White House, ONC/HHS, and the broader environment, that are helping to usher in a wave of new technologies and services that will lead to better health care, health, and cost savings through continuous quality improvement. One of the more exciting initiatives taking place is a unique effort to unite early stage innovators with the broader ecosystem to shepherd and nurture new technological development. One of the greatest challenges facing any health care innovator is to develop ideas with the broader environment – working with a myriad of stakeholders in an appropriate manner to obtain the crucial data needed to validate the effectiveness, value, and strategy tied to the innovation. I’m referring to getting to the critical stage known as the proof-of-concept. Realizing that getting to this stage requires substantial time and resources, I’m pleased to report that the White House Startup America Initiative, in partnership with HHS, is promoting an effort called Innovation Exchanges for Health IT – a model that promotes facilitated forums that assemble a collection of early stage, near-proof-of-concept innovators with forward looking health care organizations. The explicit goal of this program is to identify opportunities for testbeds to support innovative development. This is a first-of-a-kind initiative that helps to cross stakeholder lines in the interest of innovation. Health care organizations that participate can identify potential future developers that they wish to collaborate with from a host of candidates in a single day, substantially lowering their search costs. Innovators can find potential partners by presenting to a dozen organizations at once – saving precious time and accelerating their development timelines. While not meant to be a commercial opportunity, participants are free to identify scope and duration of their collaborations. The first Innovation Exchange for Health IT took place in Philadelphia earlier this year, under the leadership of BluePrint Health IT. We’ll see at least three more events taking place in Indianapolis (October), San Francisco (September), and in the New England area (October) sponsored by a variety of organizations. As I’ve noted before, community building is an essential step in the innovation process. These exchanges are an attempt to provide the opportunity to forge the relationships needed to sustain those communities. Feel free to contact me if you would like to participate in a future exchange. To comment directly on the ONC Health IT Buzz Blog, click here. Note: The first Innovation Exchange for Health IT took place on May 26, 2011 in Philadelphia as the BluePrint Health IT Innovation Summit. Prior to the Summit, the format was described by John Halamka as 'e-Harmony for IT' in his blog post on Speed Dating for IT. Following the Summit, John Moore of Chilmark Research, provided a summary of the successful matching in hospitals and health IT innovators. Both Halamka and Moore serve as members of the BluePrint Health IT Innovation Exchange Summit series Advisory Board. This blog is produced by Mike Squires, Executive Director, BluePrint Health IT Innovation Exchange Summit, and Vice President, Strategic Development and Public Policy for BluePrint Healthcare IT.